Residents in 150 areas in England will be supported in developing and sharing skills to manage land – such as parks, waterways, woodlands and green spaces – according to the needs and aspirations of local people, thanks to a new partnership between Local Trust  and Shared Assets  launched today [27/09/2017]. The partnership will provide advice, support and opportunities for knowledge-sharing to people from Big Local areas  who want to transform land, that may be neglected or underused, into useful and productive spaces that support livelihoods and bring important benefits to the community. Big Local is a resident-led programme of local transformation and the biggest place-based funding programme currently distributing funds, with £1m invested over 10-15 years in each of 150 ‘left behind’ communities in England, that have missed out on previous funding programmes. Shared Assets brings to the partnership expertise in new models of land management that are financially sustainable and create livelihoods and shared public spaces. Map the land management achievements of communities involved in Big Local and explore the challenges they face when they want to own or manage land. 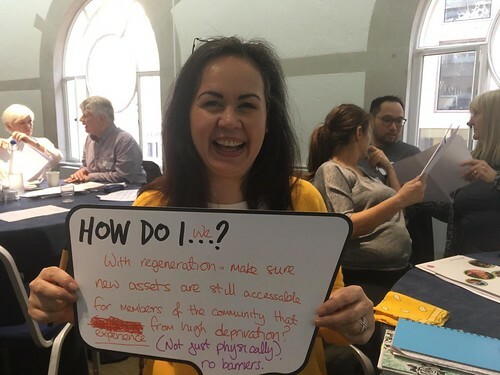 Enable residents from across the 150 Big Local areas to come together and learn from each other and from Shared Assets about land management opportunities. Demonstrate to Big Local areas how managing land can be a powerful way to secure the lasting legacy and sustainability of their Big Local funding. Offer residents in five Big Local areas a bespoke support package to enable them to achieve their land management goals. Share learning from the Big Local experience for all those interested in securing long-term sustainability of local assets in the common interest. Local Trust’s partnership with Shared Assets is one of a range of new opportunities  offering Big Local areas access to a wider range of expert support for resident-led local transformation. Together, they give Big Local areas connections to new resources and networks, specialist technical advice tailored to local needs and access to fresh and innovative approaches.